QUESTION: Do you favor a breed? For a specific type of class (amateurs or equitation vs green hunters)? In hunter and equitation classes that do not require a horse be of a specific breed, we see all breeds in the hunter arena. Thoroughbreds, Quarter Horses, Arabs, European sport horses (Hanoverian, Holsteiner and Swedish and Dutch warmbloods, etc.) are just the tip of the spectrum of breeds. In the pony division we can add Welsh, Connemara and many more crosses. 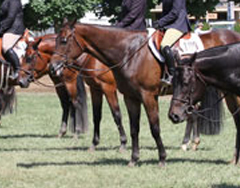 The question of breed preference in judging could involve conformation most suitable for jumping, manners of a particular breed or way of going that approximates the ideal mount for a ride around a hunt course. Manners and a relaxed expression exemplifying a judge’s preference for a hunter also come into play and can complement a rider’s equitation ride on course. Given the broad spectrum of breeds, we asked the judges if they have a preference of breed type.